One of the most common injuries during a car accident is a herniated disc. 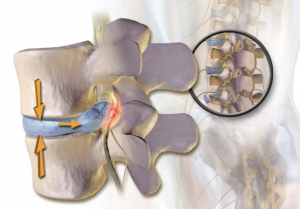 A herniated disc can be caused by the force of the Collision in a car accident. The force of the Collision causes the jelly layer in between your spine to balloon out or rupture. A herniated disc can cause severe pain depending on the severity, a herniated disc causes pain by impinging on the spinal cord. this type of pain can cause radiculopathy, which is sharp pain and numbness. The symptoms may not occur immediately after a car accident, but it can also develop after time passes. Even if you do not get a herniated disc, there may be a bulging disc instead which can also cause chronic pain in your back. For your neck, whiplash is a big cause of herniated discs or bulging discs. Since the symptoms may not appear immediately after a car accident, it is best to go to doctor that knows how to treat car accident patients after your motor vehicle accident. 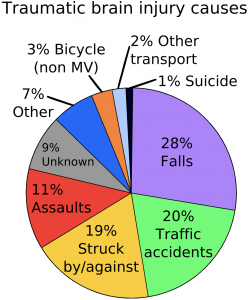 Traumatic brain injuries or TBI is caused by your brain Heading the inside of your skull or your head striking something in your car such as a windshield or a steering wheel. Traumatic brain injuries are serious, it can change the way your brain functions. A traumatic brain injury can cause dramatic personality changes and also cause forgetfulness. It is not something to take lightly. This type of injury can cause grief for you and your family. One of the key signs that you may have suffered from a Traumatic Brain Injury is if you were unconscious after a car accident. If you think you have a TBI make sure to get medical attention immediately. The longer you wait to seek treatment the more concrete your symptoms will be and the tougher it is to be treated. The knee injuries can happen several ways. The impact of the collision can cause your knee to hit the dashboard which can tear your ACL, MCL, and meniscus. 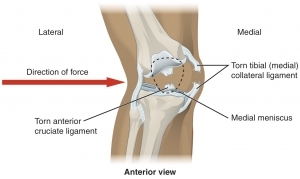 A T-Bone collision is also another way your knee can get injured. Having these injuries is more obvious compared to a spine injury because if you have a torn ACL, MCL, or meniscus it is easier to tell when you have pain standing up or walking. If the pain is not too severe you may have some soft tissue damage that we can help you get fixed. The most common way your shoulder gets injured during a car accident is when you get T-boned. The side impact can crush your car and impact your shoulder. If your car has side airbags this is another way you can sustain shoulder injuries. When your shoulder is severely damaged it is best to go see a physician to diagnose the injury immediately. If the shoulder injury goes untreated it can cause severe problems and you will have to get surgery. It is best to come see an auto accident doctor to be able to diagnose you with the injury. If it is just soft tissue damage you will not have to get surgery, but if it is a tear, we will have to send you out to a surgeon to get surgery. Why should you come to Epic Chiropractic and Wellness? There are many hidden injuries that a car accident can cause. Being able to see a physician who is trained to detect these injuries is the best thing you can do for your health. Car accidents are physically and mentally draining. Getting the correct care for the injuries you sustained during a motor vehicle accident is crucial. At Epic Chiropractic and Wellness in Brandon, Florida, our chiropractor, Dr. Matt Wilson is an expert in treating patients that have sustained car accident injuries. If you have been involved in a car accident and need to seek treatment in Brandon, Florida or Gibsonton, Florida, please call us immediately. We will be able to guide you through this process with our knowledge of car accidents. Our team can refer you to the best attorney in town to handle your case and make sure all your medical bills are paid. Being in a car accident can be very stressful. The emotional impact and physical impact may not be felt immediately because of the adrenaline you experience after a car accident. One of the most important things you can do is to always go to a doctor that knows what to do after a car accident. There aren’t many around that understand the symptoms and where pain after a car accident can appear. At Epic Chiropractic and Wellness in Brandon, FL we specialize in treating pain after a car accident. Do not hesitate or wait to call our office, our staff is well experience in helping auto accident patients get the help that they need after a car accident. It is normal to get a headache after a car accident. Headaches that happen often after your car accident may be a sign of some delayed injuries you may have. During the accident you may have experienced a concussion or whiplash that may be causing your constant headaches. This is not to be taken lightly because you may be suffering from a traumatic brain injury. This type of injury is debilitating to yourself and others. Seeking medical attention immediately after a car accident is important because of this type of injury. The faster you are able to go see a doctor the easier it is to treat the symptoms. Ignoring your headaches and dizziness after a car accident can be fatal. At Epic Chiropractic and Wellness we know how to treat dizziness and headache symptoms after a car accident. As for Traumatic Brain Injuries, we can help diagnose it and send you to the correct doctors in order to treat it. This can happen from your head rapidly going forward from being rear ended or you rear ending someone. This can either be whiplash or a cervical herniation. These types of injuries can cause you pain for the rest of your life. Diagnosing whether you have a Herniated disc or whiplash in your neck is important in order to start the right treatment plan for your injuries. Since there is a X-ray in the clinic Dr. Wilson will immediately get your X-rays taken. If Dr. Matt Wilson suspects that you have neck pain due to either a herniated disc or whiplash, he will script you out for an MRI in order to confirm the diagnosis. Once the diagnosis is confirmed the treatment plan of manipulative therapy will start. Conservative therapy is usually all that is needed and can be done by Dr. Matt Wilson in Brandon. Some injuries can happen as you get t-boned and your shoulder slams into the side of the car. This is a very common injury in a car accident and can be easily diagnosed. Whether it may be just some shoulder pain or a ligament tear at Epic Chiropractic and Wellness we can help guide you. We are able to treat specific types of shoulder pain and if needed we can also refer you to the correct facilities that we trust. Tingling or numbness is usually a good indicator if you are suffering from a herniated disc or pinched nerve. This type of pain can go all the way down to your buttocks and you may think the injury is due to something other than your spinal cord. These impacts due to a car accident cause bulging discs or herniations. The pain may not appear immediately and can sometimes take several days. Being in corrective care chiropractic , we are able to treat these systems in your spine after a car accident. Having problems in certain areas of your spine can lead to more health problems later on. Your spine is a part of your central nervous system and your central nervous system controls your body function. At Epic Chiropractic and Wellness we perform a different type of chiropractic therapy. We perform corrective care chiropractic, different from other chiropractic physicians because we focus on the central nervous system and what areas of the spine control certain functionalities. If you have pain after a car accident and need help relieving your pain, call Epic Chiropractic and Wellness today, we have offices in Brandon, FL and Gibsonton, FL. Our staff is experienced in treating auto accident patients and can get you the help you need. If you have recently been involved in a car accident, do not wait to get check out, call now.